My daughter wanted to have something special to share with her friends when she invited them over for her birthday party. 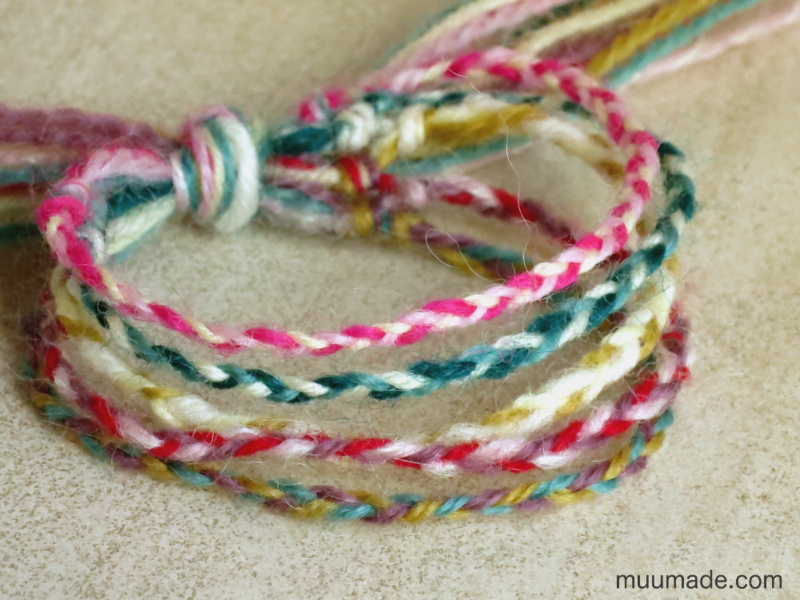 So, we decided that the girls would make friendship bracelets for one another. 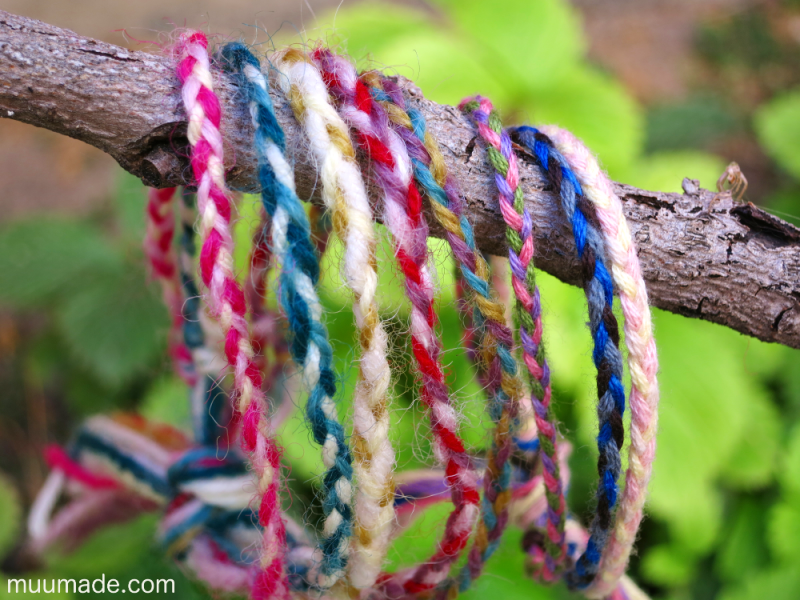 The basic idea is that each child makes a simple braid for every other child and then the braids are combined into one friendship bracelet for each child. So, if there are 5 children, each child makes 5 braids in the colors of his or her choice. 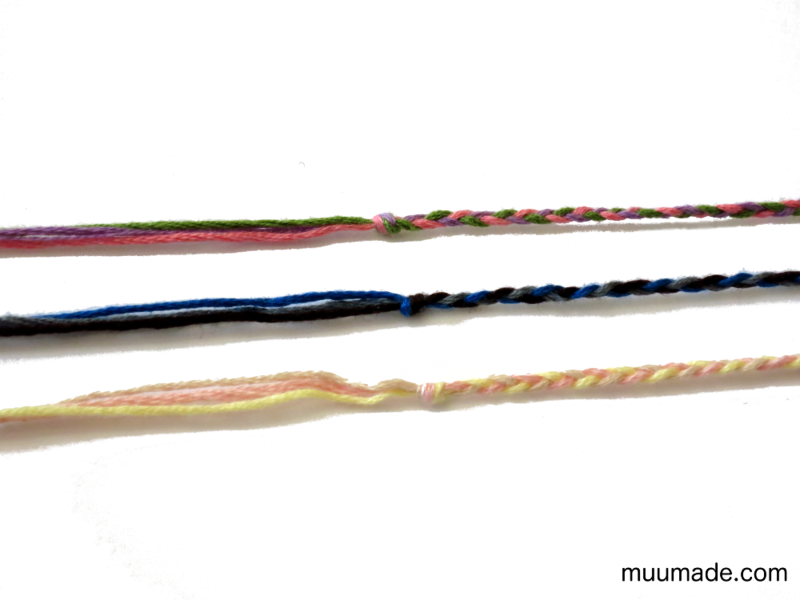 Then, they exchange their braids, so that everyone receives a braid from every one of their friends in their bracelet! My daughter wanted to use thin yarn for her party, as shown in the photo above, but I regret having done so. The yarn shrinks and sticks together after it is worn for a while. Instead, I prefer using embroidery thread. 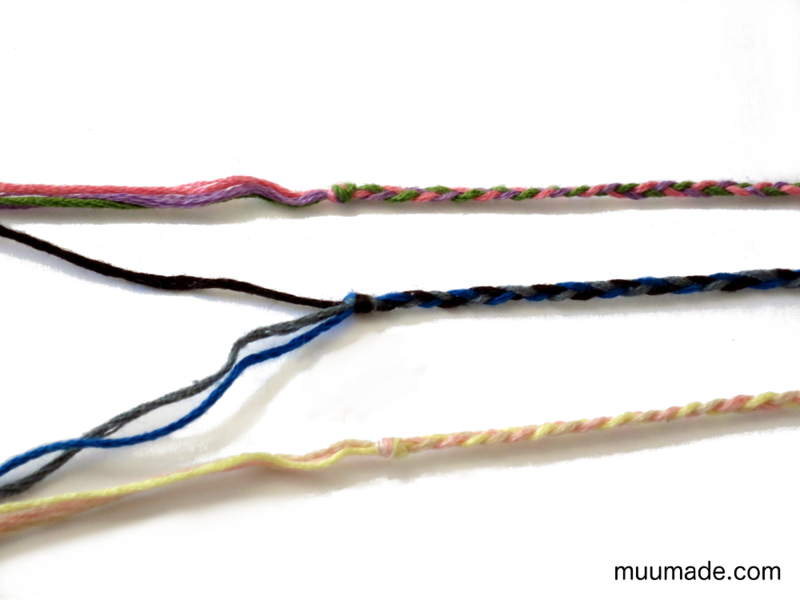 I think you can also use thin cotton crochet thread (Size 5 or thinner). I recommend this activity for small parties; it works well with 5 or fewer friends (i.e. braids). 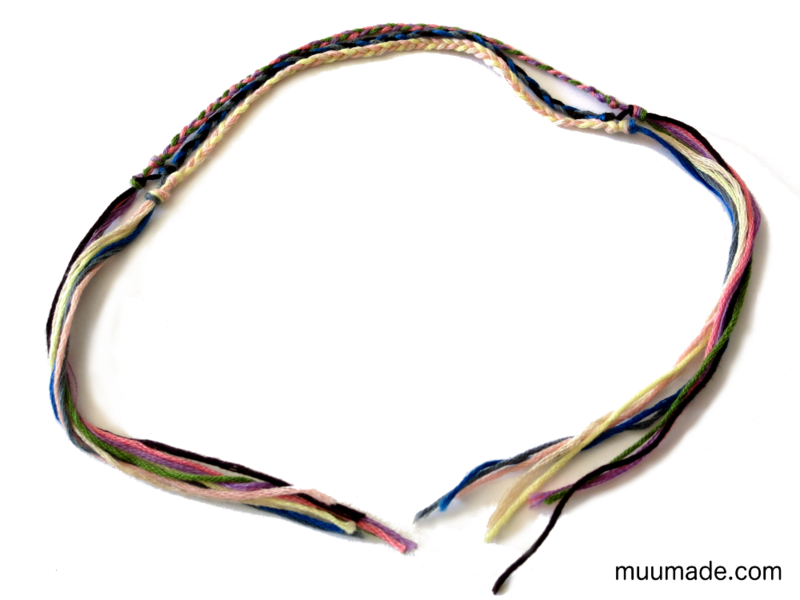 With more than 5 braids, the bracelet becomes too bulky. 1. Ask each child to pick 3 colors of thread. (Embroidery thread comes with 6 separate strands wound together. 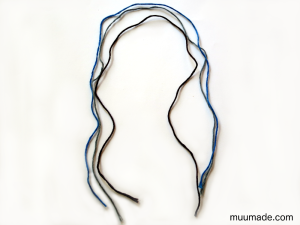 Treat the 6 strands as one thread.) 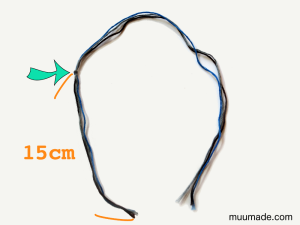 Cut the trio of threads into 45 cm (18″) long pieces, as shown in the photo. Make as many sets of the same 3 colors as there are friends. For example, if there are 3 friends, prepare 3 sets of his/her chosen colors for each child. 2. 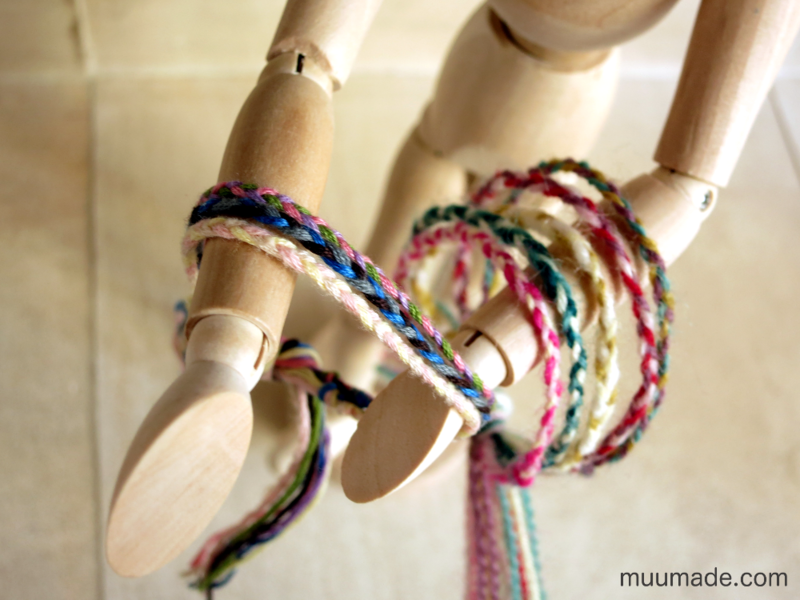 Make a simple knot (an overhand knot for example) approximately 15 cm (6″) from one end of each trio of threads. 4. When the braid becomes 12 cm (4 3/4″)* long (when pulled taut), make another knot at the end of the braid. Continue until each child has made as many braids as there are friends at the event. *Note: You can adjust the length of the braid depending upon the size of the wrists of the children. 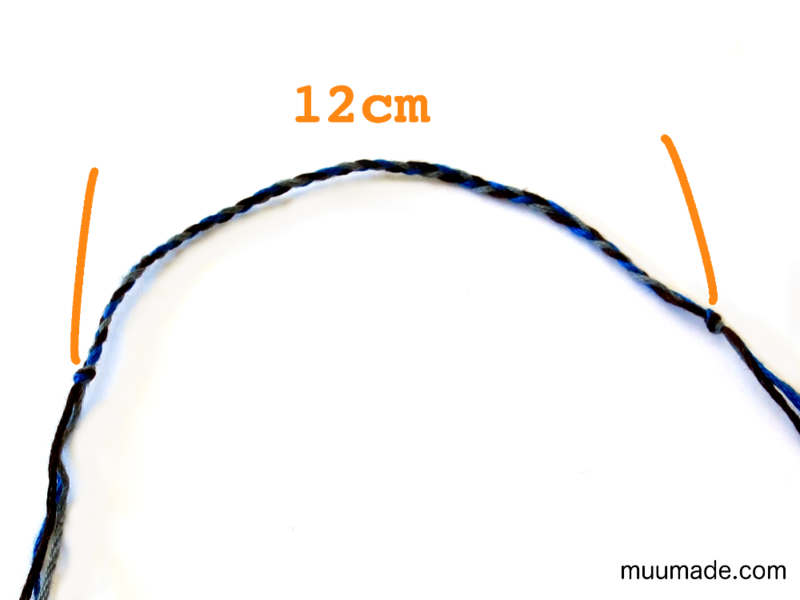 You want the braided part to be approximately 2.5 cm (1″) shorter than the circumference of the wrist. 5. When all of the braids are made, have the children exchange their braids with each other and arrange them in whatever order that they like. 6. Now it is time to tie the individual braids together. 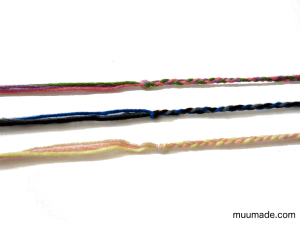 First, gather together the 3 threads from the top braid (pink/green/lilac in the photo) along with 1 thread from the second braid (dark brown). 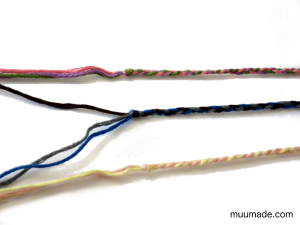 Note: If your friendship bracelet has only 2 braids, tie those 2 braids together and skip to Step 9. 7. 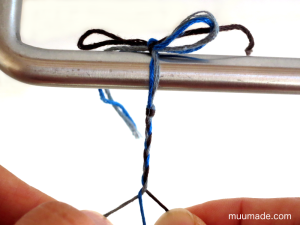 Tie together the threads that you grouped in the previous step right next to the knots of the 2 individual braids, as indicated by the arrow in the photo. If your bracelet has only 3 braids, go to Step 8. 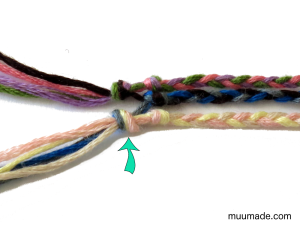 If it has 4 or 5 braids, make another knot in a similar manner, this time using 2 threads from the second braid and 2 threads from the third braid. If it has 5 braids, make yet one more knot, using 1 thread from the third braid and 2 threads from the fourth. 8. 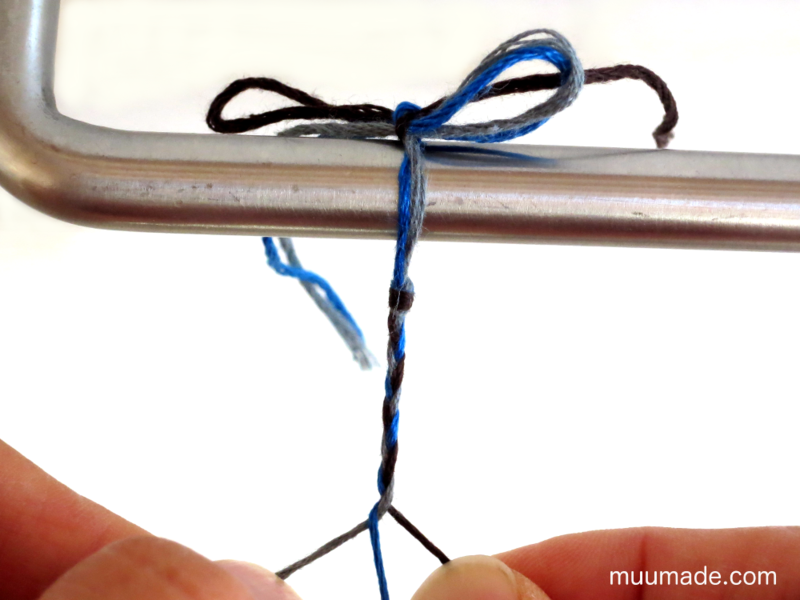 When you reach the last braid, make a knot with that last braid and the 1 or 2 threads left loose from the previous braid. 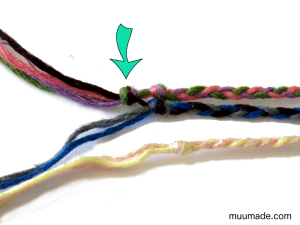 Now you should have all of the loose ends connected at one end of the bracelet. 9. Repeat Steps 6, 7 & 8 at the other end of the braids. 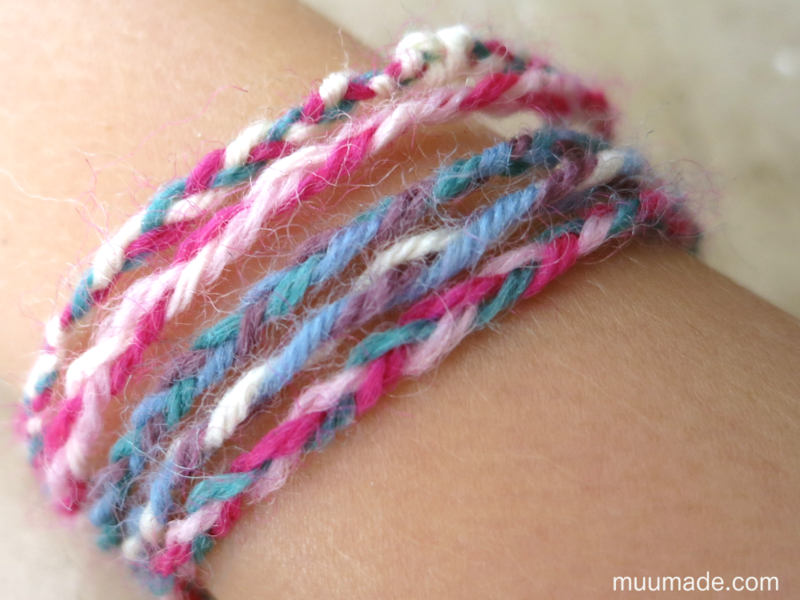 Now your friendship bracelet is finished! 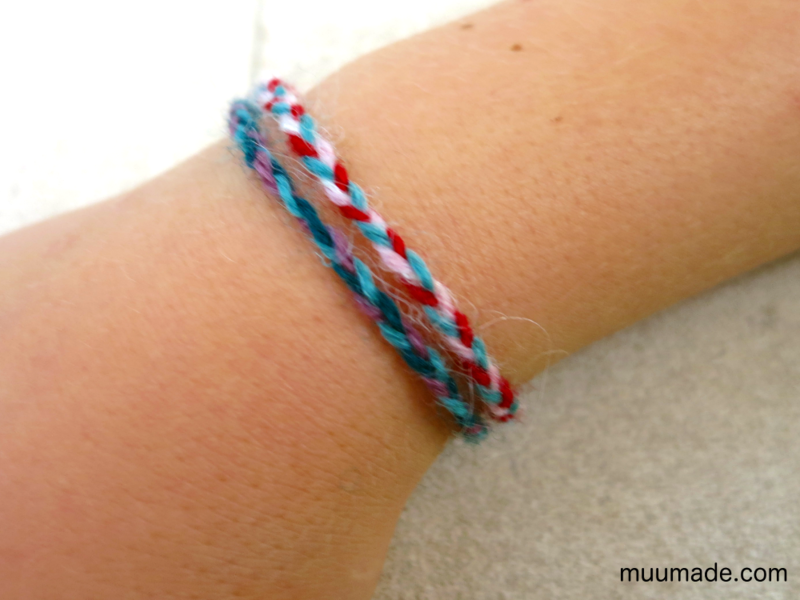 Here is an example of a two-braid friendship bracelet. When you or your children make friendship bracelets with your/their friends, share their images at Muumade’s Gallery.